Because nothing says "I love you" like bulbous homemade doughnut monstrosities that look like they've risen from the depths of the ocean. I used a buttermilk cake doughnut recipe from my never-fail Meta Given's cookbook. It said "chill the dough for 2-3 hours." At the end of 2.5 hours it was clear that the dough was never going to reach any more substantial firmness than it had. "Roll out to 1/4" inches," it said. I tried. It stuck to the rolling pin. I grimly added flour, and more flour, and more flour after that until it was less sticky, but it was still obviously not going to be cut-able, so I started scraping spoonsful into the oil for doughnut 'holes'. "They're doughnut STARS!" 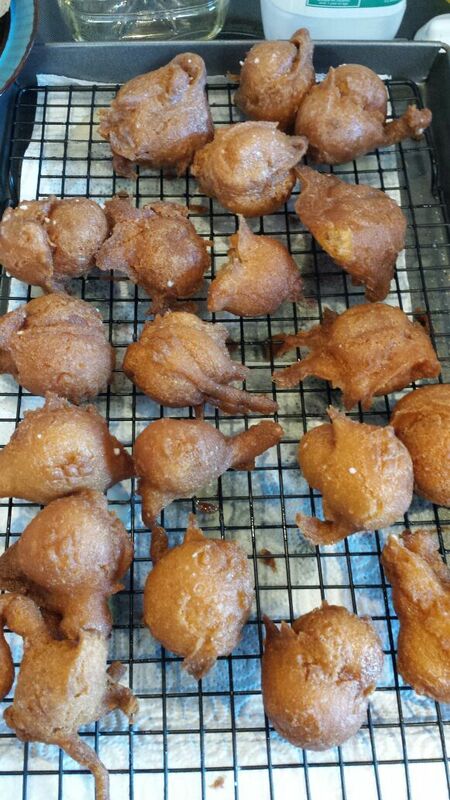 said Ted, helpfully, but in the end, no, they are bulbous doughnut monstrosities from the ocean's depths. Which wouldn't be so bad if they weren't also *oily*, although they were cooked at the indicated temperature for the indicated length of time. Even Ted didn't know why they were oily, although he said, "They *taste* fine," which I thought was...generous. I think they taste mostly like oil with a baking powder mouth feel. some oils cook better than others at the same temperature - that's what i found when trying to make some Norwegian Xmas cookies. I think they look delightful! Alas, I guess the cookbook's undefeated status has been broken today! I somehow suspect that could make a tasty fried chicken batter. They *look* like the Pancake Puppies from Denny's. Which are then coated in powdered sugar and dipped in syrup or frosting. Maybe the wrong flour? That's all I can think. But, hey--you made the doughnuts!